Bison Tool & Abrasives is a representative for a full line of metal fabricating machinery, tooling and parts. Our service specialty is sharpening Annular Cutter Bits & Standard Drill Bits. Locally, we service our customers with machine repairs, preventive maintenance, and making sure they keep their production machinery up and running. Bison Tool is located in Buffalo, NY. The company is the on-line division of JR Machinery Associates, Inc. We offer United States and Canada easy access to competitive priced tooling for press brakes, Ironworkers, Band Saws, Tube bending and other metal fabricating support items. We are ten minutes from the Peace Bridge connecting Buffalo to Canada. We offer a full line of metal fabricating tools and machinery at competitive pricing. We have been in the metal fabricating industry serving our customers for over twenty years. 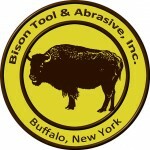 Bison Tool and Abrasive takes pride in servicing our customers with the upmost professional courtesy. We like to think we are valuable partners to shops we work with. Thank you for visiting our website. Give us an opportunity to prove our quality commitment. Free shipping on orders of $ 75.00 or more. There is a flat additional shipping charge of $ 25.00 for Canadian orders. Check out our pricing – we believe these prices are the best in the industry! Please contact us at (716) 352-3911 or bisontool@earthlink.net with any questions.